Bottle label may vary slightly. 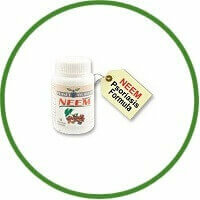 Ingredients: Neem (Azadirachta indica extract) 500mg, Vegetarian Capsule Shell, Cellulose and fumed silica. Clears the skin, Purifies the blood. It’s a powerful natural anti-biotic causing no side effects. Helps in clearing psoriasis and other skin blemishes. For most users, results show up within 5-10 days of treatment.